I have a little helper. He’s very adorable and he knows it! And will work it for all he’s worth! How can I resist such big blue eyes? He’s been unwell at the moment, so we’re all feeling quite indulgent! I’m sure you’ve all been on tenterhooks wanting to know what I bought at the Craft Fair, so here we go! The outside two (the gold and the pink) are lace weight silks from Bart and Francis. The gold I have a plan for. You’ll have to wait for that one; I still need more pieces to the puzzle before I can begin. The pink I just couldn’t resist! Such a beautiful antique faded rose. I think it will make a truly breathtaking shawl when I find the right pattern. 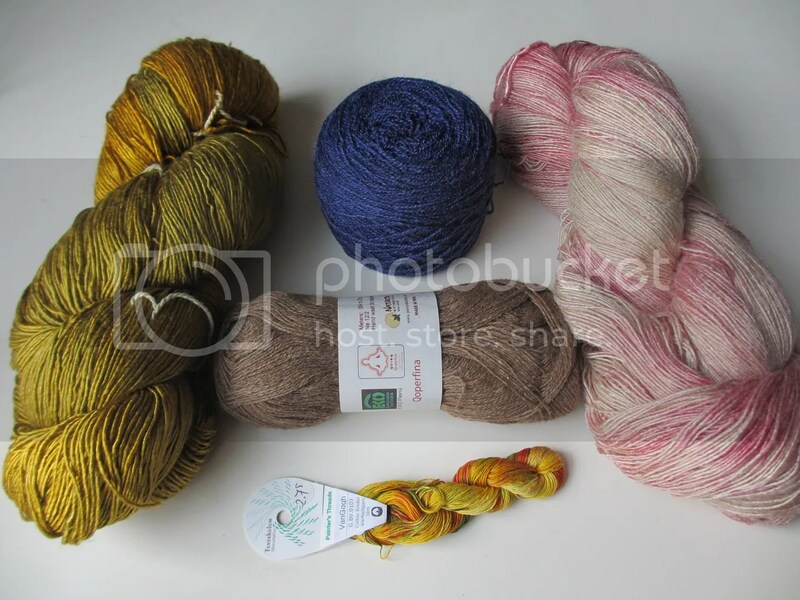 Top to bottom the three in the middle are; a lace weight wool from Loret Karman, a lace weight alpaca, cotton, and copper (yes copper) blend from Weldraad, and a hand painted embroidery floss in the colours reminiscent of Van Gogh’s “Sun Flowers”. I’m planning on using it to make one or more of my Irish Crochet flowers. I think it will make a stunning centerpiece motif. Then there was this amazing purchase from Loret that I had been dreaming of and coveting since I first saw it at the fair last year! 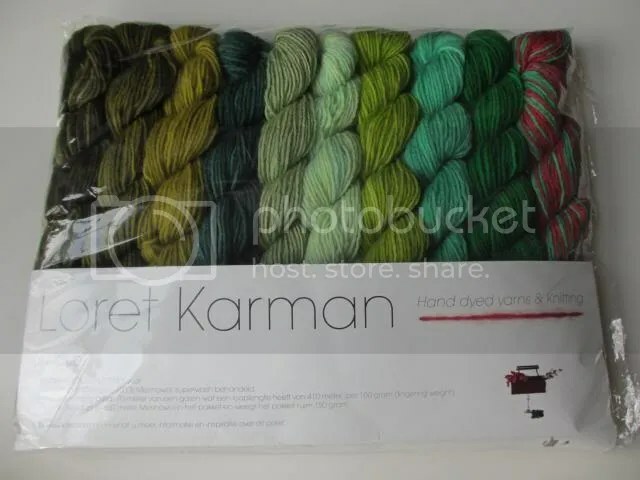 Loret is an amazing woman who has been commissioned by the Van Gogh Museum to create pallets of some of the artist’s most famous colour ways from his paintings, and his box of yarns! 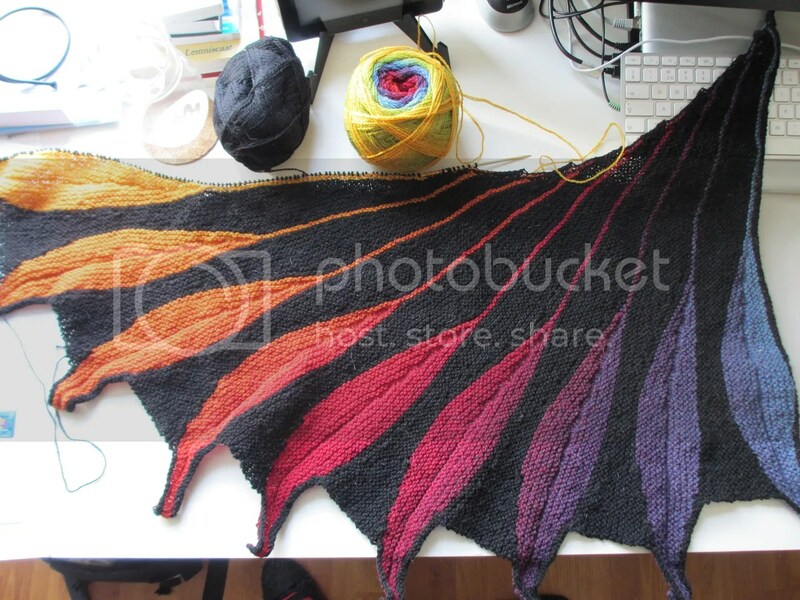 Finally, This is where I’m up to on the DreamBird Shawl which I am making out of the Kauni EQ yarn I picked up when I was in Haarlem. I still have a long way to go, but I think it’s coming along quite nicely! The rainbow makes me smile every time I see it. I think that this shawl will being me many years of happiness both in the wearing, and the memories of my helper, helping me knit it. So many pretty things! The colours are lovely and I can’t wait to see what you have in mind for the gold. Do you have plans for the Loret set as well? There is so much of the gold that it may have a couple of lives in it! I only know of one of them so far 🙂 The Loret is a bit more of a mystery, though something in my head keeps nagging at a beekeepers quilt. That would make an excellent pattern to showcase the way the colours look together, I would think.